The Shower Room Ltd is a friendly, family run company from the specialising in easy access bathing, shower rooms, wetrooms and bathrooms. 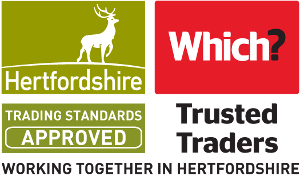 Jago has over over 10 years experience in designing, supplying and installing bathing facilities and has been Hertfordshire Trading Standards Approved for over 8 of those years. Here at The Shower Room we aim to help you every step of the way. So, whether you require a new en-suite, a shower facility carved out of an unused space, a future proof easy access wetroom or a traditional or designer luxury bathroom we (my team and I) have the experience to deliver with the highest of standards. All images are taken from projects that have been designed and installed by me and the team. This seemed to us to be quite a tricky job involving blending new tiling with old without requiring any decoration in the rest of the bathroom. Simon and Jago completed the work exactly as specified. Simon took great pride in his work and cleaned up at the end of each day. All the work was of high quality and care was taken to avoid any dirt or damage anywhere in our house. At the end of the work we asked for one modification. This was done promptly, neatly and without complaint. We would have no hesitation in recommending The Shower Room. Jago, William and Simon did an excellent job of refurbishing our shower room, including fitting a new shower screen, tray and backing tiles, new floor tiles and repainting throughout. The initial estimate was clearly set out and in fact the job was completed within budget. They were always considerate and helpful, and the work was done to a high standard, with minimum dirt and disruption. They also suggested and carried out some finishing touches we hadn't thought of. Payment was in stages and the final payment was not requested until we were absolutely satisfied with the finished job, which we were. I would highly recommend this company to anybody. Jago and his team took on a remodeling project to convert a large bathroom, along with an airing cupboard and passageway area, into a bedroom with an ensuite. Jago`s quotation was detailed and very clear. We were also ably supported by Jago`s suppliers who helped us to make the right decisions for fittings and tiles. Once the work begun they were professional and friendly, always arriving on time, each and every day, from start to completion and always putting in a full days work. They always vacuumed and left the work area very clean and tidy. The Shower Room have a wide skillset which enabled them to find excellent solutions to unexpected issues that arose during the project. Jago also suggested various imaginative ideas that enhanced the aesthetics and functionality of the space. They were meticulous in their approach and it was clear that they strive for excellence. We are delighted with the finished work which has enhanced our property. We would whole heartedly recommend them and will use them again. Shower ripped out and replaced within my bathroom. New hidden cistern for toilet installed. I found Jago and his team a pleasure to have working in my house. They were punctual, polite, tidy and delivered a high standard of workmanship. I had a query a week after the work was completed but Jago was round within a few hours and had it sorted in a few minutes. Charlotte paid a lot of attention to detail with her ideas for the tiles, shower, shower door etc so the new shower design compliments my bathroom and doesn't stick out as a new addition. This time we had our family shower room remodelled. Jago and his team are very professional tidy polite and methodical. They are a pleasure to have in the house and the standard of their work is extremely high. We used Jago and his team to gut our existing en suite and update, and were so impressed we got them back six months later to do the same on our family bathroom. At every stage of the process they are professional and transparent – communication is always excellent. They will advise on design and products if desired, and are prepared to go the extra mile to achieve the perfect finish where others might cut corners. They were also very conscientious in trying to minimise the disruption for us, which was much appreciated. Above all else they are trustworthy – they turn up when they say they will, are honest about potential problems and don't make unrealistic promises about the cost or duration of the job. And the quality of the work is excellent. I have no hesitation in recommending. New shower and tiles fitted by a friendly, reliable team who daily arrived and started work at the time promised. A minor problem which arose following completion was attended to and corrected within 2 hours of making it known. We are thoroughly satisfied with the end product. Jago and his team completely altered our bathroom to suit my disabled husband. His ideas were excellent and the team were a pleasure to have in our home. They stripped the room back to brick walls changing all the pipeing and we found the sink unit and radiator weren't suitable where they were going to be. Without hesitation they then spent a complete day to get it changed to a new position saying it had to be right for us. We are delighted with our new room, the workmanship is first class and they were such clean workers. I have complete faith in recommending them to anyone. Great service, good price, lovely result. Jago and Charlotte of the Shower Room were most helpful and courteous in dealing with us over installation of an accessible shower for my 100-year-old father. Nothing was too much trouble before during and after the intallation which was designed and completed very much according to my fathers requirements. The only glitch was when a supplier sent the wrong shower tray but it was spotted and quickly rectified. My father is very pleased with his new shower which is so much easier and safer than his old shower over bath arrangement. And it looks great too. We had our bath removed and a shower area installed. Jago was excellent in his work ethic his timing his professionalism his knowledge and of course his skill.I trusted his advice and our ensuite now looks beautiful.